The police dragged rowdy protesters out of the Planning Authority premises on Thursday, after they showed up at a board meeting in protest over controversial plans for another new fuel station outside development zone. Two of the activists were bleeding as they were forcibly removed from the building by Rapid Intervention Unit officers, witnesses confirmed. Footage shows them being manhandled, sparking anger among the protesters who insisted they were doing nothing illegal. Police and RIU officers turned up at the premises shortly after eNGOs Moviment Graffitti and Kamp Emerġenza Ambjent activists turned up in protest during a PA board meeting discussing the fuel station planned outside of development zone. The application was subsequently rejected, with 10 votes against and one in favour. Acting chairman Elizabeth Ellul came out to speak to the ever-growing number of activists at around 11.30am, giving them the opportunity to enter and address the meeting "calmly". However, they insisted that the only way to be heard was outside the meeting - adding that they were staying put. The hearing had to take place by law, she said. The police subsequently started to drag out the protesters as the hearing resumed. The activists are protesting that a full nine months after the authorities’ promise to review an "obscene" fuel service station policy, no changes have been made so far. "The current policy allows the construction of massive so-called fuel stations (read: shopping complexes) on natural and agricultural land designated as ODZ. We demand that the processing of all pending ODZ fuel stations applications is suspended until the reviewed policy enters into force," Graffitti said in a statement. The NGOs added that the size of pending and approved ODZ fuel stations was seven times the size of the Floriana granaries. There are currently 12 pending applications for ODZ fuel stations covering a total area of over 52,000m². Four ODZ fuel stations with a total area of 12,000m² have already been approved. "Even in the case of the Żejtun fuel station being discussed by the Board on Thursday, the PA has once again shown that it goes to great lengths to accommodate developers," they said. The application, which is recommended for refusal, would take up some 3,000 square metres of land in a designated area of agricultural importance and a valley protection zone linked to the Wied iż-Żring watercourse. The Nationalist Party criticised the police for using excessive force and said the duty of the police had been to protect the activists and their right to protest. 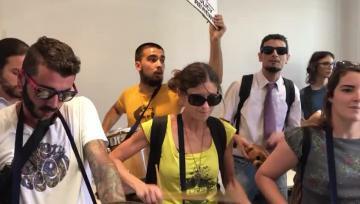 In a statement signed by Beppe Fenech Adami and Hermann Schiavone, shadow ministers for home affairs and for social dialogue, the PN regretted that a peaceful protest had been turned into a violent episode in which activists were injured as efforts were made to stop their protest. The PN said people had a right to protest and the state should ensure that the police were there to protect those who protested, and not to silence them. In a truly democratic country the people, civil society and the police deserved better. The Democratic Party said the police action was shocking. It said none of the officers were trained to deal with such a situation and they seemed to blunder through. 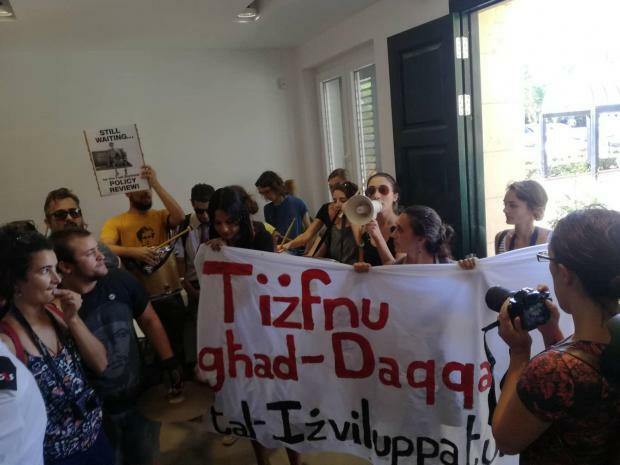 The PD blamed PA for having NGOs resort to such protests, "as this independent entity has scandalously forgotten the true holistic priorities of our nation and Malta’s true interests on numerous counts." The party also criticised the government for its delays in drawing up the new fuel stations policy.